The re-release of Jet Set Radio will launch at a familiar $9.99 price point. Sega's re-release of classic Dreamcast titles continues with Jet Set Radio, due out later this year for a variety of platforms. The publisher just announced that PlayStation Plus subscribers will be the first ones to get their hands on Jet Set Radio on September 11, 2012. The PS3 version will be available for everyone else a week later on September 18. 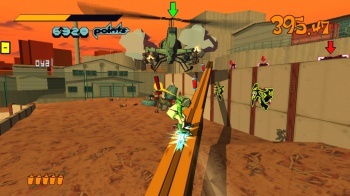 Next up are the Xbox Live Arcade and Steam versions of Jet Set Radio, which are due to launch one day after the PS3 version on September 19. Finally, the game will make its way to the PlayStation Vita almost a month later on October 16. The game will be $9.99 across all platforms, which is reminiscent of the Dreamcast's memorable 9/9/99 release date. Those of you still mourning Sega's final console only have a few weeks to go until you can download Jet Set Radio and spray graffiti to your heart's content.